Keeping a consistent tone throughout your translation is important. We highly recommend that localizers create both a glossary and style guide for their language. These needn’t be large or complex, but it’s important to cover the edge cases specific to your language. To keep your translations consistent we recommend you build and use a glossary, which is merely a list of words and definitions of words specific to your language. Technical terms are often very specific in certain languages and vary from one locale to another. Creating a glossary ensures you use consistent terms throughout your entire WordPress translation. To start building it, we recommend looking through various glossaries (like this list of computer and internet terms and WordPress Glossary Codex page) and add words to yours that might be ambiguous. You can add as many of these as necessary. You can also include terms from WordPress Jargon Glossary, and make use of existing translations from translated terminologies from other widely-used projects (e.g. Microsoft’s “Search Terminology” tool). We recommend you use the GlotPress glossary feature. It can be used for your WordPress translation indefinitely and will always be centrally located. On GlotPress, there are two types of glossaries. Locale glossary: Terms included in this glossary are suggested across all projects. Only GTEs can create modify this. Project glossary: Terms are suggested on the specific project only. GTEs and PTE of a project can create and modify its glossary. If you are getting started, it’s best to build your locale glossary first. In locale glossary, include string and translation pairs for terms that are commonly used by WordPress projects, including WordPress core. Log into translate.wordpress.org as a General Translation Editor. Go to the top page of your locale by searching for your locale name and clicking the “Contribute Translation” button. Click the “Create Locale Glossary” link in the box on the top right. To add a description of the glossary, click the “Edit” link next to the title of the glossary. Create an entry or import a CSV file. When you mouse-over a term which has a translation in the locale glossary, a tooltip will show up under the term. This applies to all projects on translate.wordpress.com. For terms specific to a certain project, create a separate glossary which is used only for that project. Log into GlotPress as a General Translation Editor or a Project Translation Editor. Go to a project page in your language, where you have permission to approve translations. Click the “Create glossary” link at the top right corner. Add a description of the glossary. For example, you may want to insert a link to the style guide in your language which the glossary is based upon. 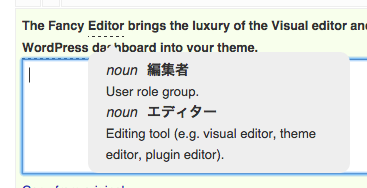 When you mouse-over a term which has a translation in the project glossary, a tooltip will show up under the term. The import and export links can be found at the bottom of each glossary page. You can build a glossary in a CSV file and import it at once. If you need to backup or duplicate a glossary, use the link to download a CSV file. To learn more about building a glossary, watch “GlotDict, Pte-Bot and BulkRejectGP. Why your community need a glossary” session from WordPress Global Translation Day 2. Once you have a style guide, put it somewhere public – the best place is your local Rosetta site so that it’s accessible for everyone looking for WordPress in your language. If you are new to building locale style guide, watch “Build Your Locale Style Guide” session from WordPress Global Translation Day 2 (presentation slides).